Explore any Jewish topic or text one-on-one with a qualified study partner - for free! Join Chavruta for an hour of stimulating one-on-one conversation with a Rabbi or rabbinical/seminary student. Over a cup of coffee you can discuss any topic you’ve ever dreamed about: Jewish philosophy, Talmud, Law, Kabbalah, Bible or discover Judaism’s take on current events. A traditional Jewish approach to study in which a pair of students analyze, discuss, and debate a shared text. Study with a Chavruta, or partner, is a hallmark of traditional Jewish learning. Together you break your heads on the texts. Two minds applied to a problem are almost always better than one. Come and join like-minded Brooklynites in a weekly study session. 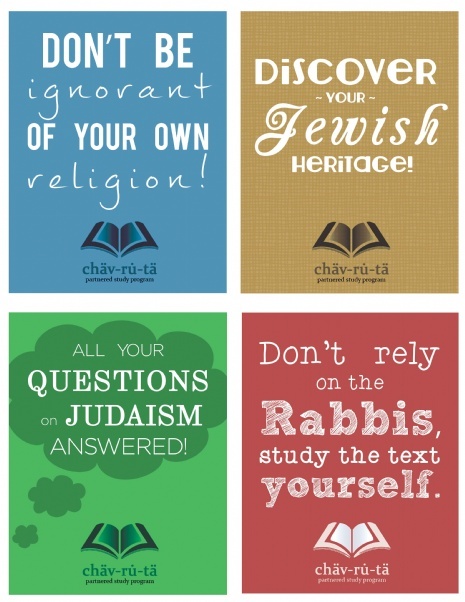 Be paired with a qualified Chavruta, and explore a Jewish topic of your choice. Whether you want to study the weekly Torah portion, brush up on your Hebrew-readingskills, master a page of Talmud, explore the depths of Jewish Mysticism, or find out more about Jewish traditions, we have a study partner for you. call Rabbi Hecht at (347) 885-6675.